Posted December 1, 2016 . In 2013, 1,500,000 people died of AIDs according to the Joint United Nations Programme on HIV/AIDS (UNAIDS) report, and 3,000,000 HIV-infected people globally are at increased risk of acquiring a life-threatening fungal infection. Each year an estimated, 700 000 deaths (47%) due to fungal disease in AIDS were estimated – twice as many deaths as estimated for patients with HIV and tuberculosis (TB) co-infection at 360 000 deaths (24%). If the world could make diagnostic tests and antifungal drugs available, annual deaths could fall for cryptococcal disease by 70,000, Pneumocystis pneumonia by 162,500, disseminated histoplasmosis by 48,000 and chronic pulmonary aspergillosis by 33,500; a total of more than 1,000,000 lives saved over 5 years. Overwhelming opportunistic fungal infections notably cryptococcal disease, Pneumocystis pneumonia (PCP), disseminated histoplasmosis (DH) are very common and major fungal causes of deaths in HIV/AIDs as well as chronic pulmonary and invasive aspergillosis to a lesser extent. Among the principal causes of fungal deaths in HIV/AIDs, it is estimated that cryptococcal meningitis accounts for up to 232,756 deaths annually worldwide, PCP at about 260,034, disseminated histoplasmosis at approximately 80,000, and chronic pulmonary aspergillosis complicating TB at 56,288. Rapid diagnostic tools for these diseases and antifungal agents are available in some countries, but not in many with high HIV burdens, and would likely have a major impact in reducing AIDS-related deaths. 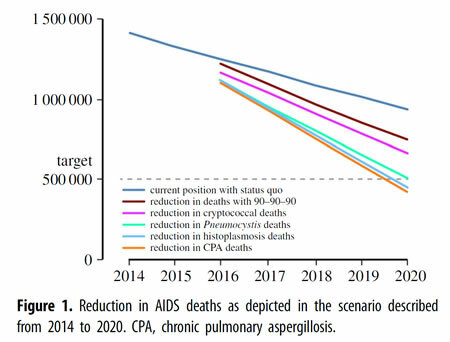 Together with the 90–90–90 campaign rollout and its effect, AIDS deaths could fall to 426,000 annually by 2020 with further reductions possible with increased coverage bringing the end of AIDS within grasp by 2030. Today is WORLD AIDS DAY – DECEMBER 1st 2016.